Oola made the long journey to Mountcollins on Saturday last and put in a great team performance beating Mountcollins on a score line of 1-16 to 1-8. Oola were behind 4pts to 1pt inside the first 10 minutes but lead from there on and ran out comfortable winners in the end. The half time score was Oola 1-7 Mountcollins 0-4. Team: Kevin Nolan, Cian McNamara, Eoin Fitzgibbon, William O’Mahony, Raymie Ryan (0-1), Stephen Ryan, Dubhan O’Grady, James Power (0-2) Eddie Kiely (0-1), Ian Bourke (0-8), Eamon Landers, Patrick Cummins, Robert O’Grady (0-1), John Bourke (1-3), Tony Burns. Oola County Junior Champions 2016 were presented with the county and county league medals Saturday last in Ballykisteen Hotel. 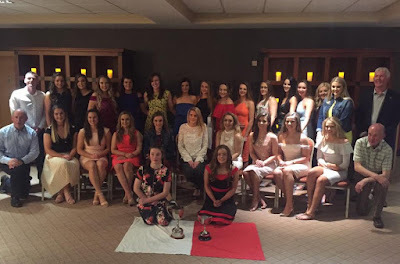 An enjoyable evening was had by all with medals presented by Cork’s 8 time all Ireland winner Juliette Murphy. Oola Weekly Lotto 27th March 2017. No Winner. Numbers drawn 3, 5, 10, 22. Lucky Dips – Breda landers Oola, Christine O’Sullivan Oola, Lily O’Leary Pallas, Hannah McNamara Oola. Next week’s draw will take place in Mari’s Cullen Jackpot will be €10,000. Oola GAA membership is now due for 2017. Monies can be paid to registrar Mixie Ryan or any committee member if you wish to become a member of Oola GAA Club. Only club members are legible to be entered into draws for match tickets. Peter Gardiner will be collecting money for CLUB Limerick draw 2017 in the coming week. The CLUB Limerick Draw for 2017 has a guaranteed prize fund of €337,000 for 2017. It provides a valuable source of finance to all clubs. At least €50 of every membership goes directly to OUR CLUB.